Over the last few months we've been overwhelmed with feedback for improvements and requests to further improve Super Simple Survey. As a small team of 3, we took a bit of time to think about how to best implement all of it as efficiently as possible. 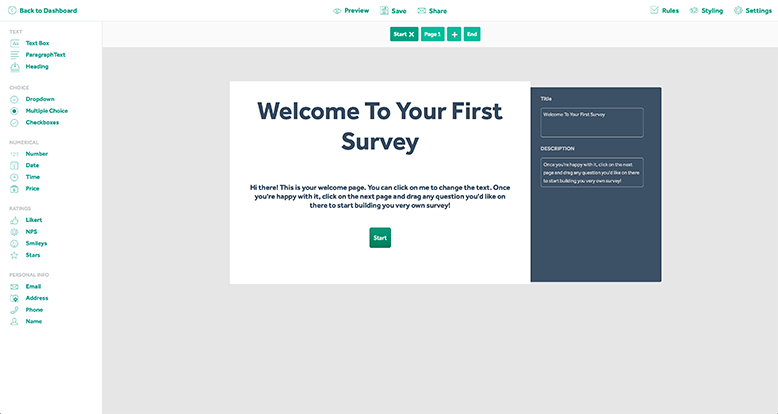 Eventually, we decided to completely redesign our survey creator, adding in a bunch of awesome new features and a brand spanking new look. We will be rolling it out for you today. We have also taken the time to look at the way our surveys look on mobile and tablet devices, giving that a little redesign in the process too. And as always, all our features are available on all our packages (including our free tier). All of this will be live starting today. Right now, actually. So sign up or sign in to take a look. If you have any feedback on the redesign, or if you have any requests for future improvements or features, let us know on our ideas page. Or feel free to drop us a mail at hello@supersimplesurvey.com. Most importantly, we'd like to thank all the honest and great feedback we've had so far regarding our product, and we hope that, together, we can continue building the best survey creator out there. Are you still reading? Time to go check it out for yourself now! Sign up or sign in!